Designed to meet the requirements of hydro-power plants, thermal-power plants and chemical industries among others, we have been supplying superior quality screw pumps to our valued customers. Pumps offered by us are manufactured using precision technology for enhanced performance. Our products are designed to run at higher speeds and have longer service life. The offered Two Spindle Screw Pump ( Series TS) supplied by us is widely used for loading and unloading fuel oil from tankers, ships, and wagons. Our screw pumps are low on maintenance and can run easily in dry conditions and even at high speeds. Their unique capability of starting at a cold temperature is appreciated by our clients. These pumps do not suffer from negligible wear and tear even after years of use. 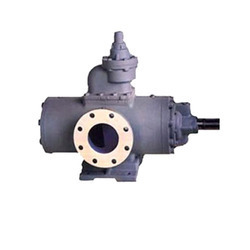 Highly efficient that these pumps are, they are excellent fro handling viscous materials. Apart from these, petroleum products like kerosene and high flammable Naphtha can be transferred easily. Crude Oil, Additives, Paraffin, Base oils, Petroleum products, Bitumen, Polyester, Fuel oils - all grades, Residues, Lubricating oils - etc. Relief valves, base frame, coupling, coupling guard, companion flanges, pressure gauges, electric motor, variable speed drives, etc. 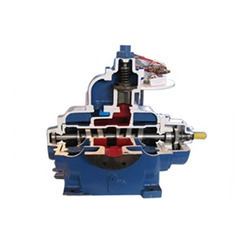 We are engaged in offering a wide array of Three Screw Pump. The screws are so profiled that they form a liquid tight seal between the thread. As the screws rotate, pockets/ cavities are formed where liquid gets trapped and conveyed from one end of the infinite stroke. This results in smooth, pulsation-free flow with extremely low noise and vibration levels, almost impossible to be achieved by any other design of positive displacement or other types.